Counsellor, Coach, Consultant . . .? We use a lot of different terms to describe what career practitioners do. When I first began working in the sector almost 40 years ago, my job title was “employment counsellor” – even though I’d never had any formal training in counselling and my only link to employment was that I’d worked part-time since turning 16. Today, the term is still used within some organizations; others are called employment consultants or career coaches, facilitators, or strategists. Although we’re likely all familiar with Shakespeare’s adage that “a rose by any other name would smell as sweet,” our messy job titles in the sector can cause confusion. Counselling has, itself, grown as a profession – the Canadian Counselling and Psychotherapy Association is celebrating its 50th anniversary this year. Although counsellors are still not regulated in several Canadian provinces, it is widely understood within the social service sector that the term refers to someone with a Masters degree and a professional designation as a counselling therapist. Over that same period of time, the work of career practitioners has also been professionalized; in Canada, core and specialized competencies have been codified in the Canadian Standards and Guidelines for Career Development Practitioners (S&Gs). Today, there are a variety of credentials and formal training programs available for training career practitioners; Life Strategies’ Career Management Professional program meets the training requirements for a variety of certifications and designations, including Global Career Development Facilitator-Canada (GCDF), Educational and Vocational Guidance Practitioner (EVGP), and Certified Career Development Practitioner (CCDP). 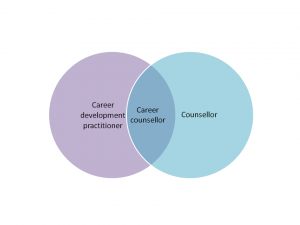 In a recent revision to the S&Gs, the Career Counselling area of specialization was reconceptualised using a Venn diagram that illustrated a Career Counsellor as at the intersection of Counsellor and Career Development Practitioner (i.e., requiring all of the core competencies from both professions). Amongst those core competencies are the foundational skills of rapport building, active listening, needs assessment, challenging, goal-setting, problem-solving, and evaluation – all these, and more, are covered in our upcoming Helping Skills to Facilitate Career Development course in the Career Management Professional Program, starting January 28, and Career Coaching Skills course, starting February 11, 2015.